This first in a new monthly series, it’s time for the August 2016 Vegan Cuts Beauty Box Review and un-boxing! I’m so excited to be doing these reviews for you and Vegan Cuts is one of my absolute favorites this month. If you are unfamiliar with Vegan Cuts, they are a monthly subscription service offering both snack boxes and beauty boxes, just like this one. 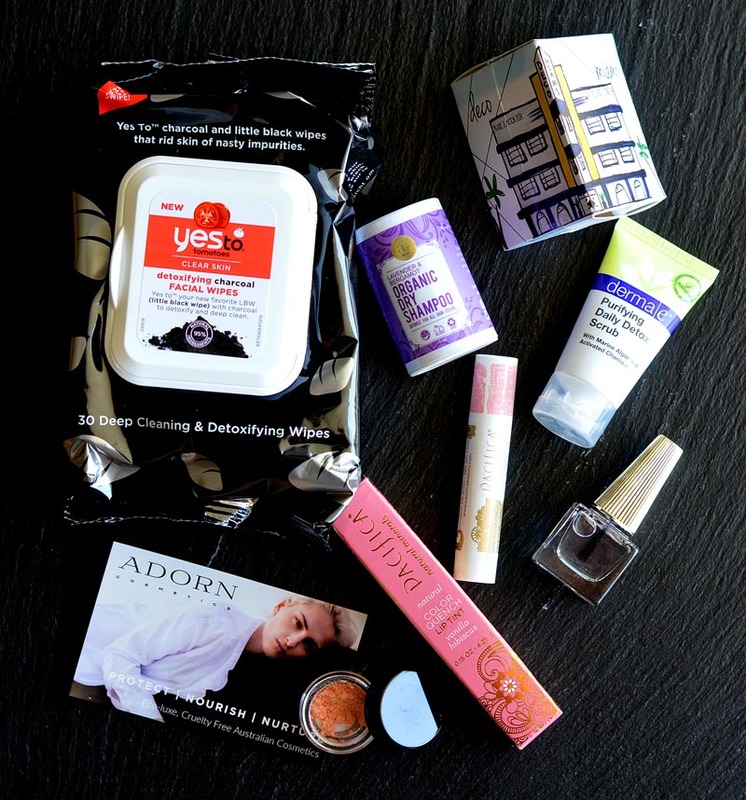 4-7 vegan and cruelty-free beauty products are delivered to your door each month. The boxes contain a range of products from skin care to high-end cosmetics. It’s the easiest way I know to learn about and experience products you may never have heard of before committing to purchase their full-size counterparts. For me, it’s all about getting that surprise each month in the mail. I am a subscription addict! The box retails for $22.95 (with free shipping in the U.S.) with additional subscription options available. You can learn more about Vegan Cuts here, but first … let’s get into the review! Yes to Tomatoes Detoxifying Charcoal Facial Wipes – This is the first time I had ever seen wipes made with activated charcoal. These detoxifying wipes are especially great for acne-prone skin, too! This is a really large package and will hold you over until you decide to purchase. $5.99 value. Derma e Purifying Daily Detox Scrub – What are the odds? My box contained two products with activated charcoal! This one also has marine algae, green tea, and apricot seed powder in it which provide gentle exfoliation. Perfect for everyday use on my sensitive skin. $2 value. Deco Miami Dual Top/Base Coat – This months box was to include one of a few polish choices & I received the top/base coat *sigh* Oh well. Kind of disappointed about that, but maybe YOU received an awesome color in your box this month? 🙂 This polish is 8-free, vegan and cruelty-free and who doesn’t need another clear top/base coat. If you are unfamiliar with 8-free nail polishes, it means: NO DBP, formaldehyde, formaldehyde resin, toluene, camphor, parabens, xylene, ethyl tosylamide or THPH. $12.50 value. Pacifica Color Quench Lip Tint in Vanilla Hibiscus – This lip tint (emphasis on the word “tint”) has a mild scent. Vanilla, perhaps? The color is very mild, so if you have darker lips, it probably won’t show up. I am pale-skinned and it was still subtle. Think moisturizing tinted lip balm as it’s made with avocado oil and vitamin E. $7 value. Green & Gorgeous Organics Organic Dry Shampoo Powder in Lavender & Bergamot – I am not much of a dry shampoo kind of girl (my straighter-than-straight hair requires daily shampooing or it is just blah). I also am not a fan of fragrance in my hair products, so this one will be gifted to a friend. The packaging is adorable though! $7.99 value. Adorn Cosmetics Mineral Loose Illuminiser Sample – This light-reflecting mineral powder gives a nice, subtle glow to your skin. Take care when opening it though as it is a LOOSE powder. Would have loved a pressed powder, but regardless…it doesn’t disappoint! $5 value. I really loved this box and already can’t wait for the September box! I thought Vegan Cuts did an excellent job curating this one and thought it had really good value. *Post contains affiliate links. Vegan Cuts kindly provided this box for review.